ESA astronaut Paolo Nespoli has been busy during the first month in space on his third mission berthing the Dragon cargo spacecraft and assisting in a Russian spacewalk. Let’s have a look at the scientific experiments he has run or taken part in since launch. The science started as soon as Paolo arrived by filling out ESA’s Space Headaches questionnaire, an experiment that is charting headaches many astronauts report having. Paolo reports on how he feels on a weekly basis to understand when and how headaches affect him. Before heading to his new bed Paolo also did a session of the FineMotor experiment that tests dexterity by assessing speed, response time and accuracy of touching symbols on a tablet. ples to see how his red and white blood cells are affected by spaceflight. His blood was frozen in the Station’s freezer to return to Earth at a later date. Paolo then tackled the Sarcolab experiment with NASA astronaut Randy Bresnik using the Mares machine to see how muscles react to spaceflight. As a side note, no coffee for Paolo on the days of Sarcolab runs, the caffeine would interfere with the results. The Sarcolab experiment involved setting up Mares and running tests as well as an ultrasound of Paolo’s muscles. This experiment is intricate and time-consuming, taking up the better half of Paolo’s first week. The second week saw Paolo take more samples for Marrow and he started collecting data for the Circadian Rhythms experiment. Paolo wears an armband and thermometer to record his temperature for 36 hours at a time. The goal is to understand how astronauts and people on Earth react to living with irregular sunlight – such as on the Space Station or when working night shifts. Paolo did the breathing sample session of the Marrow experiment and took blood samples for general use. He also did an ultrasound of his eyes together with NASA astronaut Jack Fischer before practicing for the Berthing of the Dragon spacecraft. The next day Paolo went all out on the exercise bike to register his VO2-max, the maximum amount of oxygen his body can process. 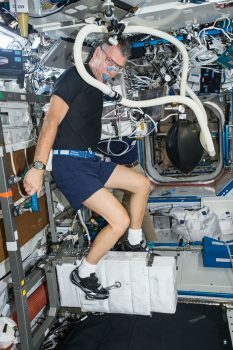 A staple indication of fitness for professional athletes, the data from Paolo will be used in a NASA experiment to understand how astronauts react to living in space. More exercise sessions are done before and after his flight. After cooling down and having lunch Paolo setup ESA’s MobiPV experiment that is aiming to give hands-free help for astronauts when working on complex tasks – mission control can look over their shoulder with a head-mounted camera and the astronaut can follow written instructions that are overlaid on a screen without using a laptop computer, in addition a smartphone or tablet is strapped to the wrist. Paolo started the Canadian Culture, Values, and Environmental Adaptation in Space (At Home In Space) experiment that involves filling in questionnaires to see how astronauts change their values over the course of a mission. Understanding the psychology of space flight is important to design even longer missions beyond Earth orbit to make them more comfortable. Paolo also tested a new lighting system that aims to help with the circadian rhythm of Space Station astronauts, using a light meter and trying different light settings. Paolo setup and ran the Kubik incubator for two Italian experiments in biological cells, mentioned previously in this blog post in the week that Dragon arrived. For two days Paolo also wrote down all his meals so ESA can assess his nutritional intake. 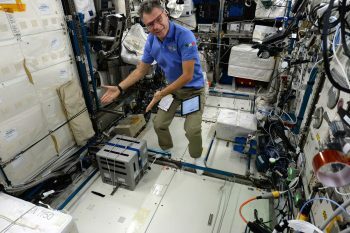 On 21 August Paolo entered the Space Station’s inflatable module and took samples of areas to see if and how bacteria are growing on the new surfaces. 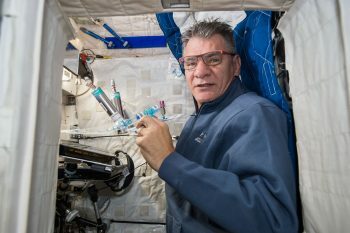 In the afternoon he did a session with Aquapad to test the Station’s drinking water and more eye exams, as well as taking a faecal sample for the Japanese ProBiotics experiment investigating how bacteria in astronauts’ gut change during spaceflight – all in a day’s work! More eye exams, saliva samples, sleep logging and working on Kubik kept Paolo busy on Friday before he operated the Justin robot from space in the evening – testing human-robot interaction from orbit. The last week in this overview saw Paolo work on the Japanese Electro-Static Furnace that melts and solidifies metals in space to understand their properties. He also took more urine samples, did Fine Motor skills sessions, Circadian Rhythms and the usual maintenance and exercise sessions.